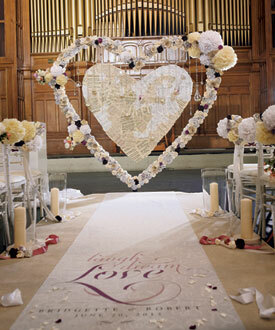 These Expressions Personalized Aisle Runners are made of 33 gram non-woven fabric. Each runner includes an attached cord handle and double-sided adhesive tape to secure it in place along the leading edge. Because this fabric is semi-sheer this runner is best suited for use on a solid floor surface. Add instant romance with a sprinkle of rose petals in colors that complement your Day! What is non-woven fabric? Non-woven fabric is created using a heat process to entangle fibers. The result is an engineered material that mimics the appearance and texture of sheer woven fabric. It is resistant to tearing yet intended for a single use.